Herculaneum V.14. 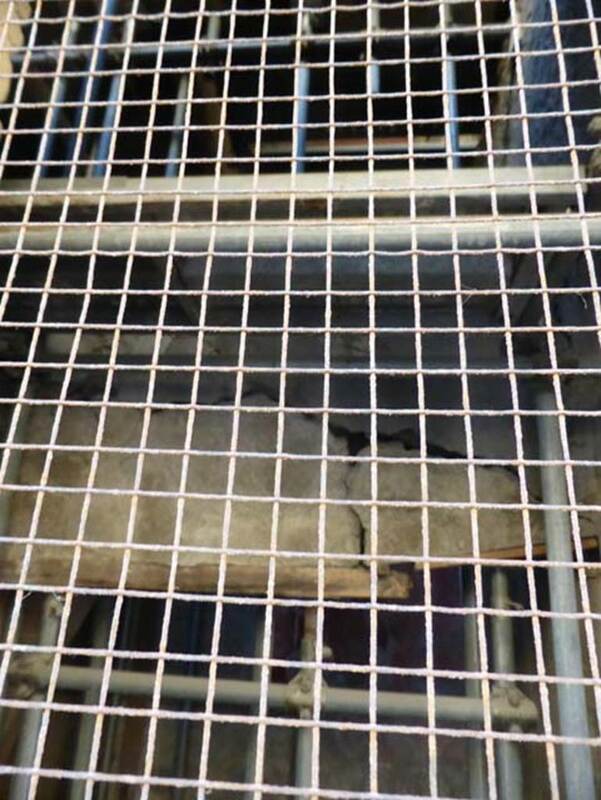 Stairway to apartment 1 on upper floor, linked to V.16 and V.13. 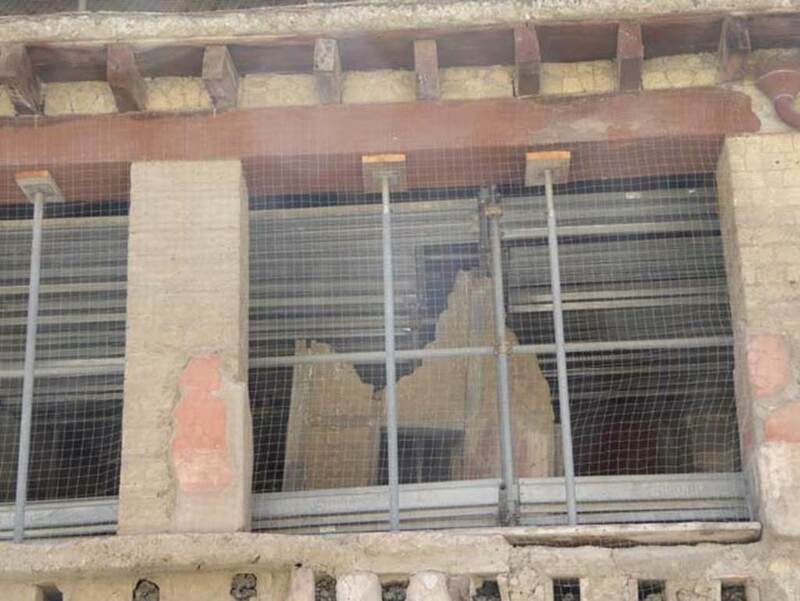 V.14 was a separate entrance doorway which showed signs of a stairway leading up to one of the apartments above, situated with a balcony overlooking the Decumanus Maximus. Linked to the shop at V.13. 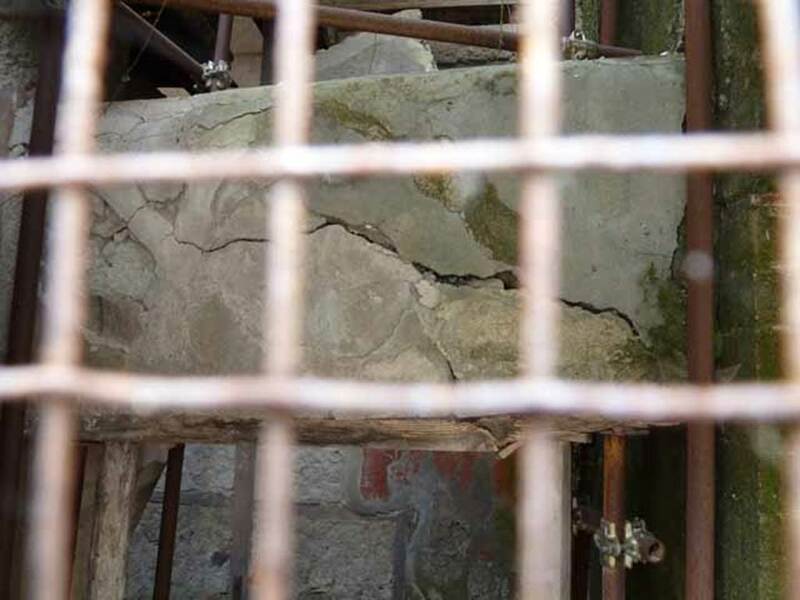 V.14 on left, 13, and 12, Herculaneum, September 2015. Entrance doorways. 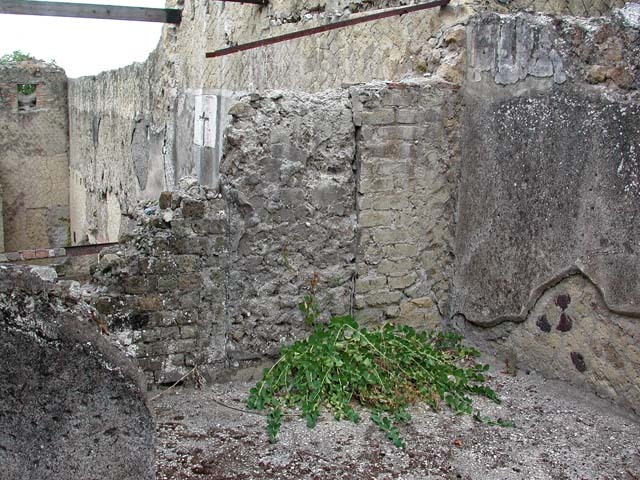 V.16, on left, 15, 14, and 13, Herculaneum, October 2014. Entrance doorways and upper floors. V.14 Herculaneum. September 2015. Entrance doorway in centre. V.14 Herculaneum, July 2015. Looking south to room on upper floor. Photo courtesy of Michael Binns. Looking west along corridor on upper floor, also known as room 39, with window and doorway to room F, aka room 8. 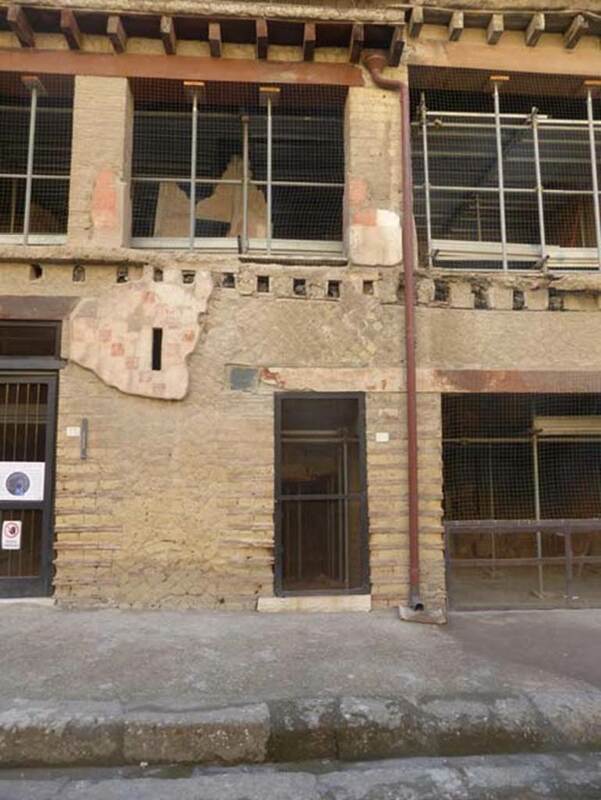 V.14 Herculaneum. September 2003. South wall of upper room 39. Photo courtesy of Nicolas Monteix. V.14 Herculaneum. September 2003. 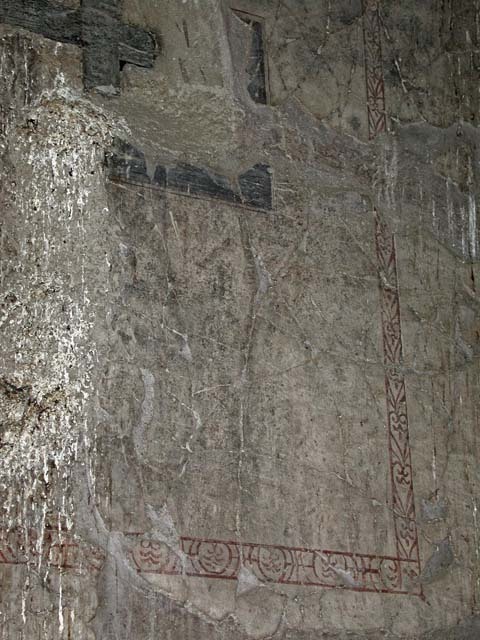 Detail of south wall of upper room 39. Photo courtesy of Nicolas Monteix. V.14 Herculaneum. September 2003. 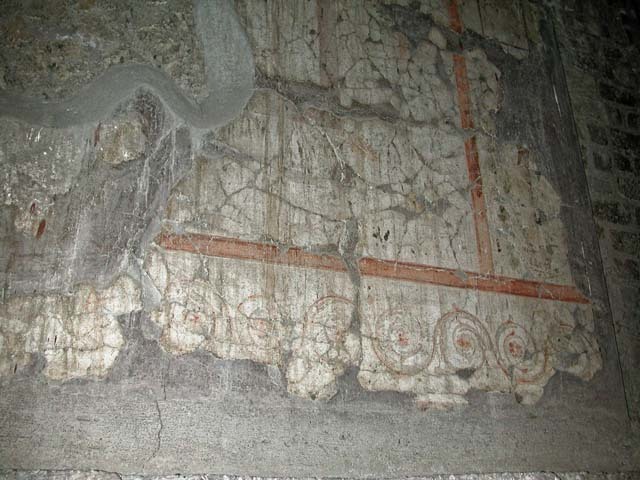 Detail of south wall of upper room 39. 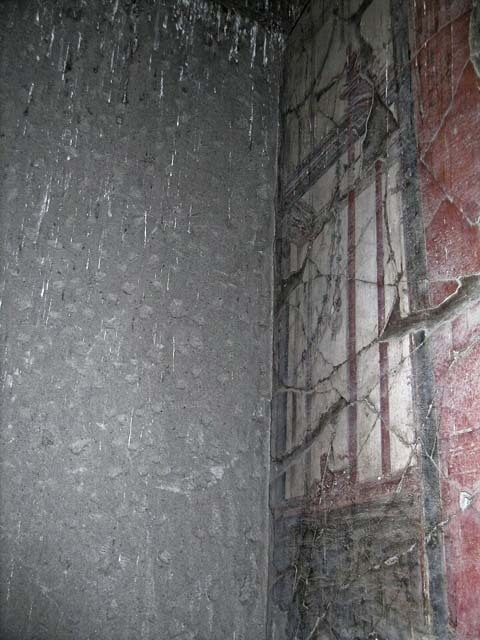 V.14 in centre, Herculaneum, May 2010. Entrance doorway and upper floor. 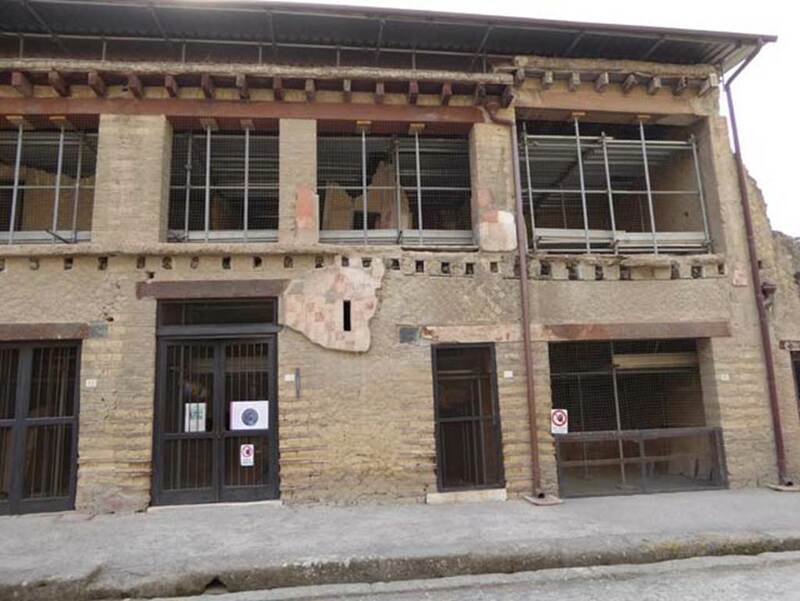 The room at the back on the upper floor above the entrance doorway was the room where 150 waxed tablets of Calatoria Themis, wife of C. Petronius Stephanus, were found in a carbonized wooden box. The contents of the tablets were still readable and recorded the story of a roman law-suit, see V.15. V.14 Herculaneum, May 2010. Entrance doorway. 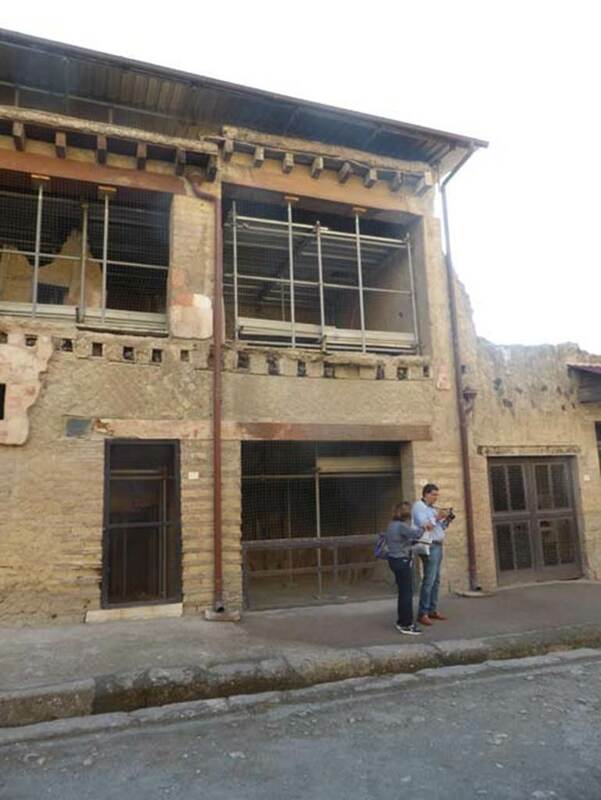 V.14 Herculaneum, September 2015. 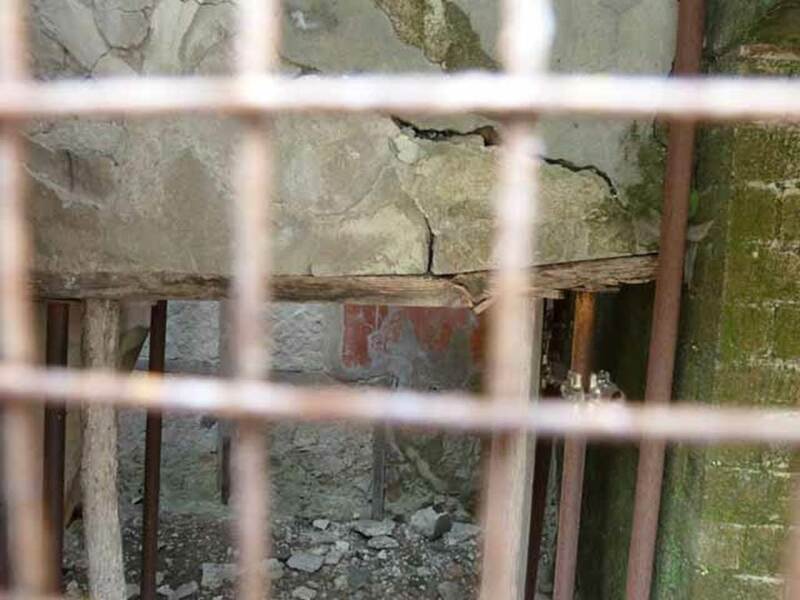 Collapsed wooden doorframe and collapsing wall. V.14 Herculaneum, May 2010. 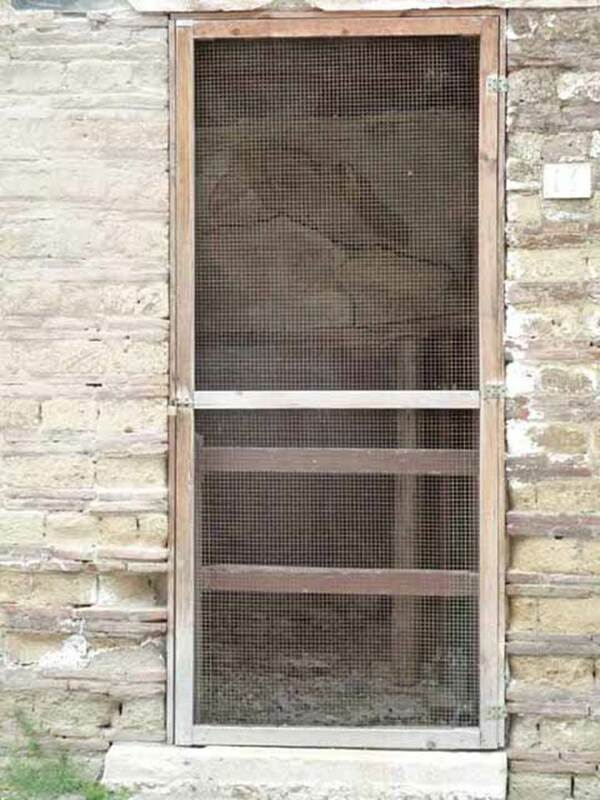 Doorway 14, collapsing wall above frail wooden doorframe. V.14 Herculaneum. May 2006. 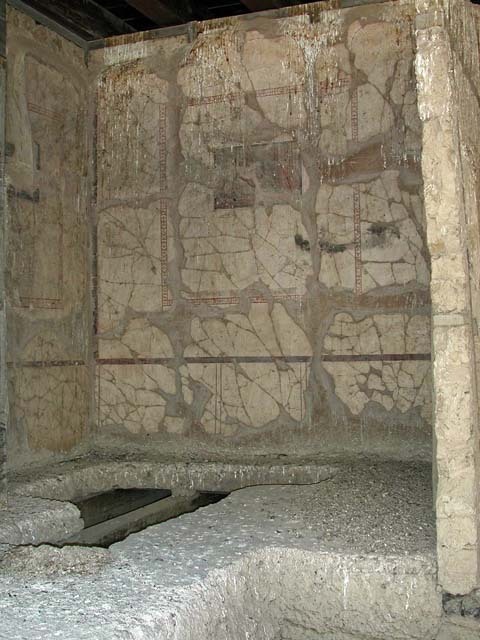 Upper floor apartment with lararium on rear wall between two cubicula. 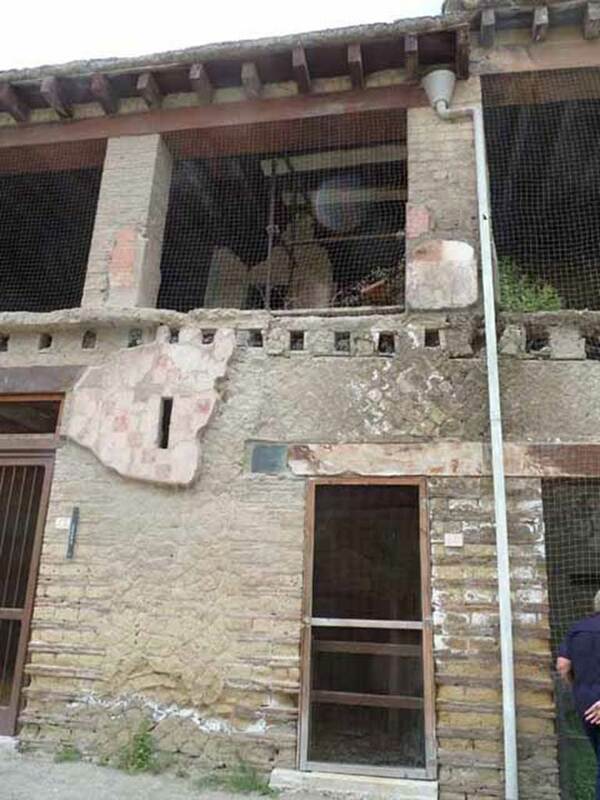 V.14 Herculaneum. September 2003. Lararium on south wall of upper room above V.14/15. V.14 Herculaneum. September 2003. 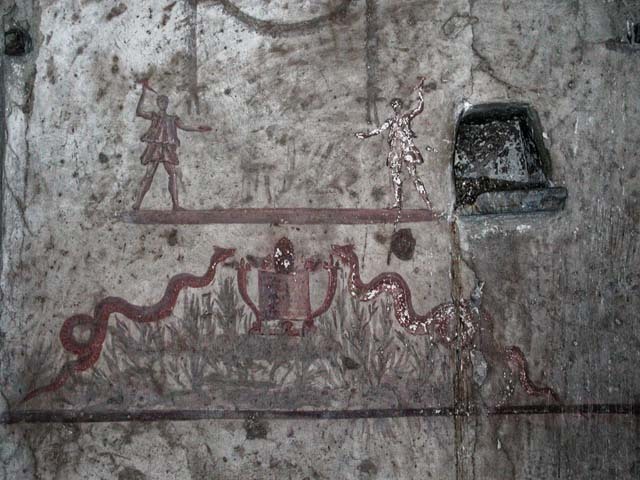 Detail of lararium on south wall of room L, also known as room 9. V.14 Herculaneum. Upper floor apartment above V.14/15. 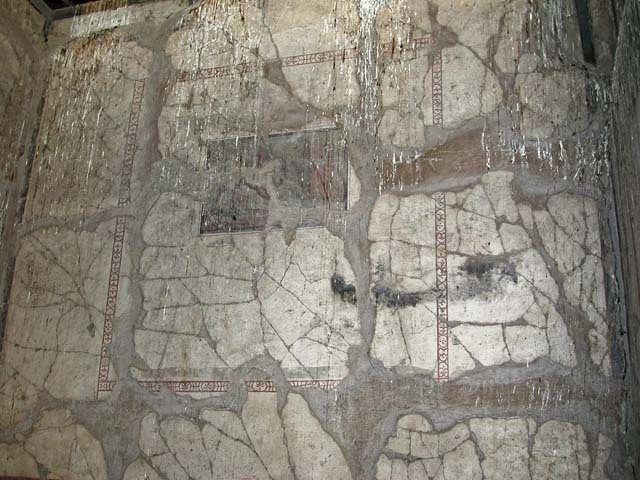 Lararium on rear wall between two cubicula. 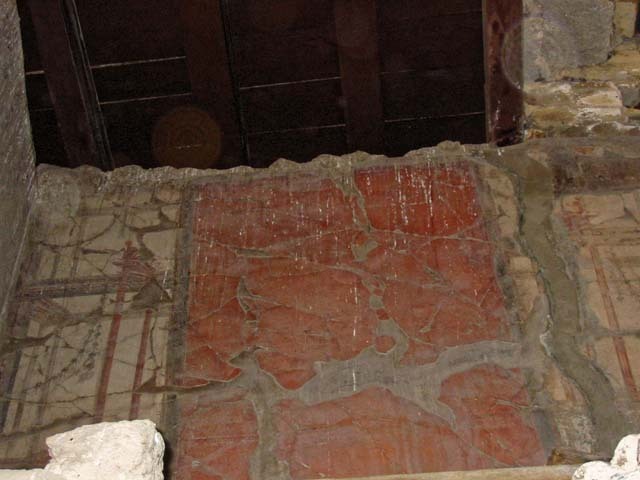 White-ground wall surface, framed in red above and below, to the right of the picture is a niche. 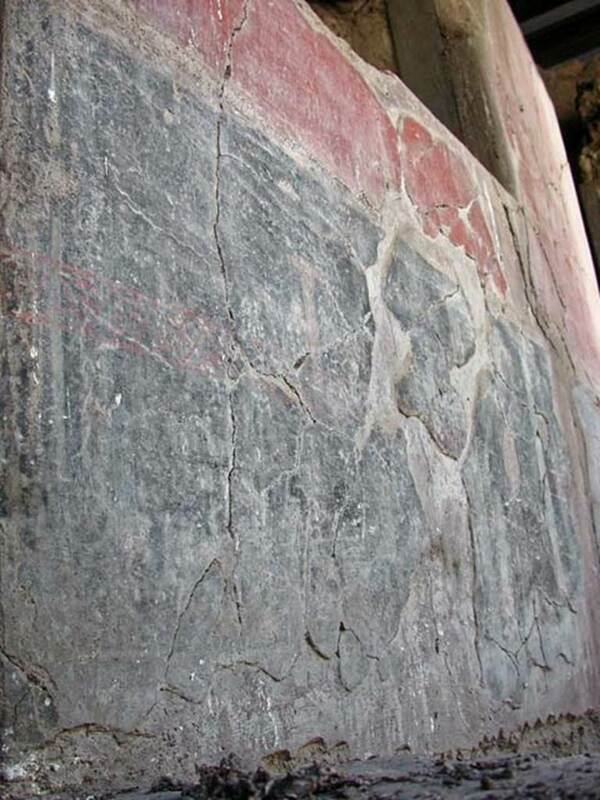 In the upper part of the picture two Lares are either side of a round altar. 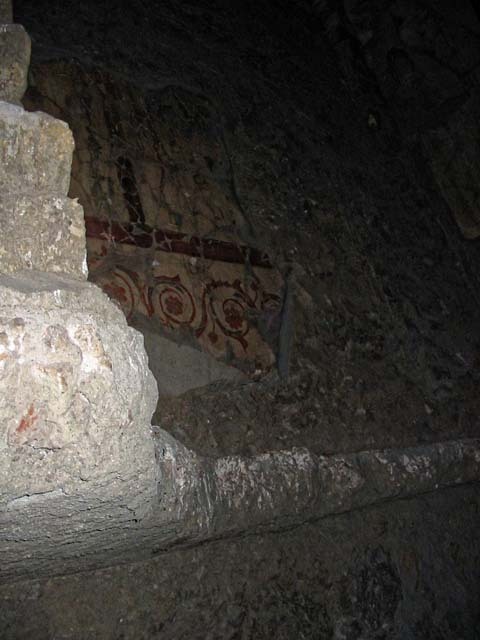 At the upper edge is a painted garland, whose ends hang down in front of the heads of the Lares. 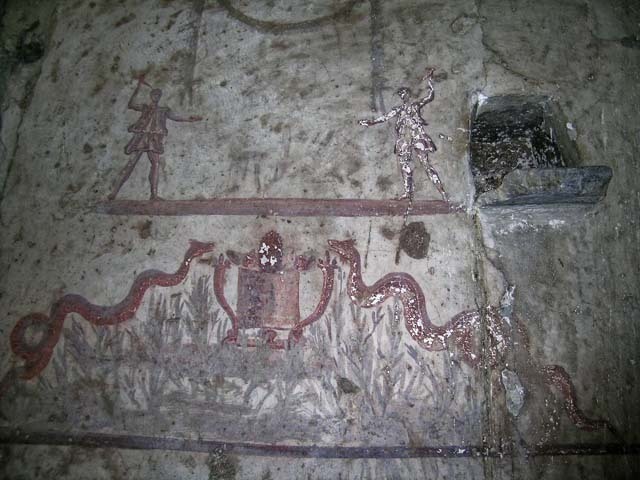 In the lower picture zone, two ascending serpents flank a round altar, which stands on a separate ledge and is surrounded by green and brown bushes. The altar has three animal feet and is framed by two cornucopias. On a second line at the lower edge of the picture are more green bushes. See Fröhlich, T., 1991. Lararien und Fassadenbilder in den Vesuvstädten. Mainz: von Zabern, L116, Taf. 49,1. V.14 Herculaneum. May 2004. Detail of lararium on south wall of apartment. V.14 Herculaneum. September 2003. Detail of lararium on south wall of apartment. V.14 Herculaneum. May 2004. 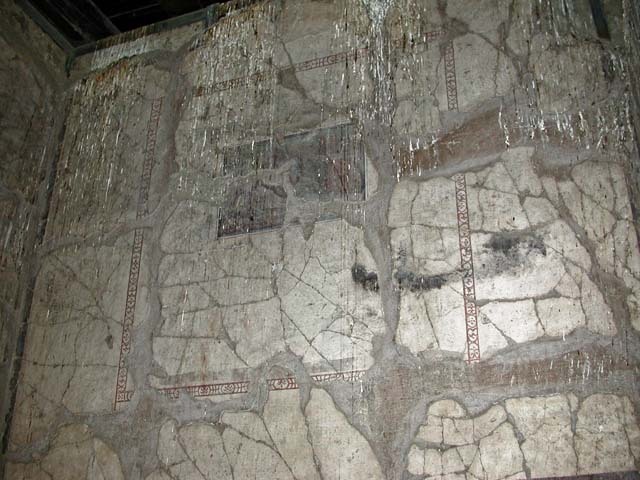 Detail of lower part of lararium on south wall of apartment. V.14 Herculaneum. May 2003. 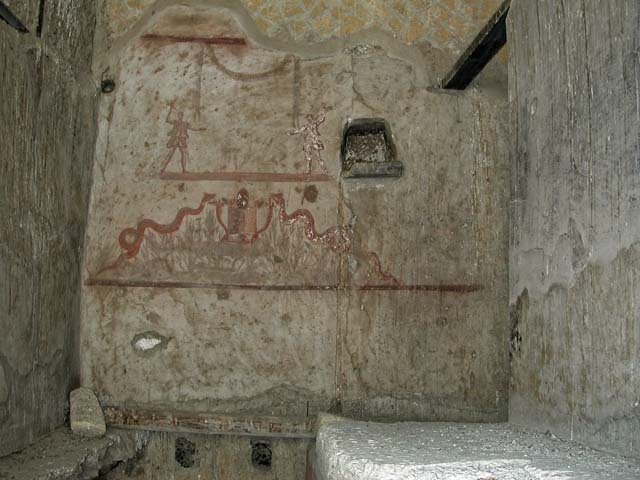 South wall with lararium painting. Photo courtesy of Nicolas Monteix. 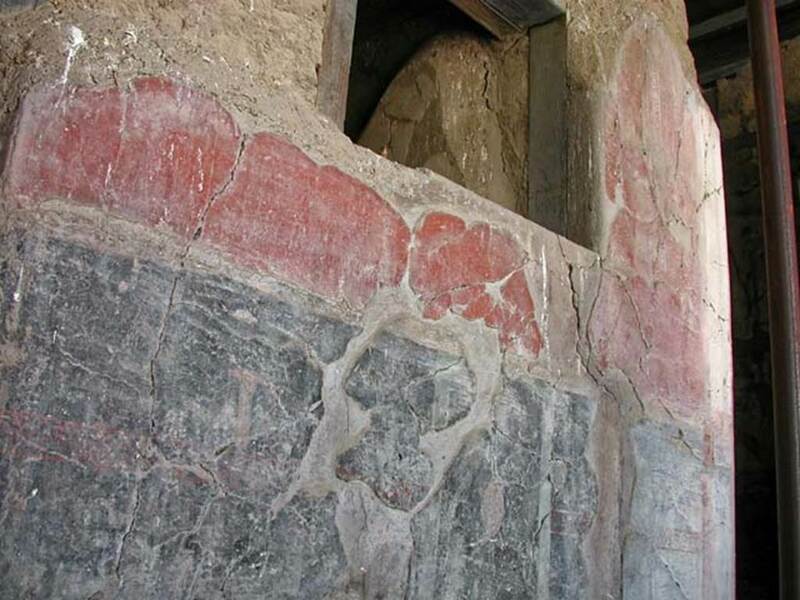 V.17 on left, 16, 15, 14 and 13, on right, Herculaneum. September 2004. Upper floor. 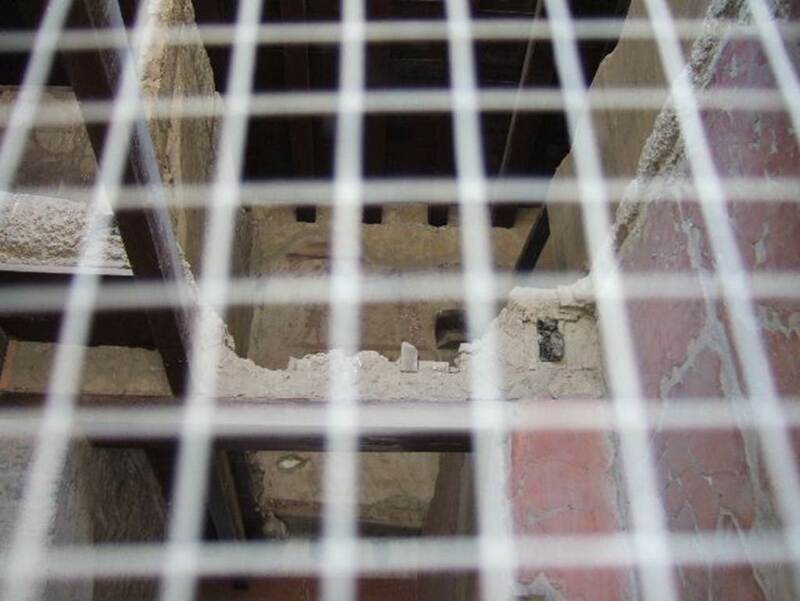 The rooms of the upper apartment on the road front were accessed from one of the two staircases of which traces remained in the ground floor rooms at no. 14 and no. 16. The landing of the staircase came up into a corridor (a) which both doorways of cubicula E & F were accessed from, both built with thin frames in opus craticium and both elegantly decorated. Upper floor above V.16, room 38, or corridor “a”, looking towards east wall. The stairs would have come up into the corridor, centre right, and the doorway on the right would have led towards cubiculum E, or room 7. V.14/16, Herculaneum. September 2003. Cubiculum E, or room 7, on upper floor. Looking towards south wall and south-east corner of cubiculum. 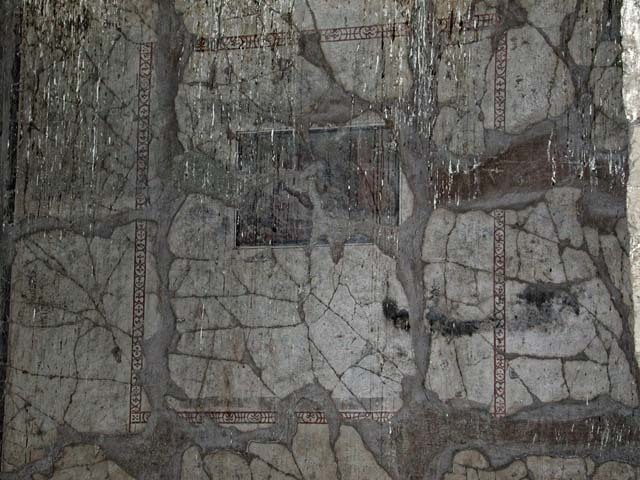 Maiuri described this room as – “having a white background with elegant partitions and architectural paintings, preserved on two walls are two figurative panels, recomposed from fragments and in part mutilated and deteriorated”. 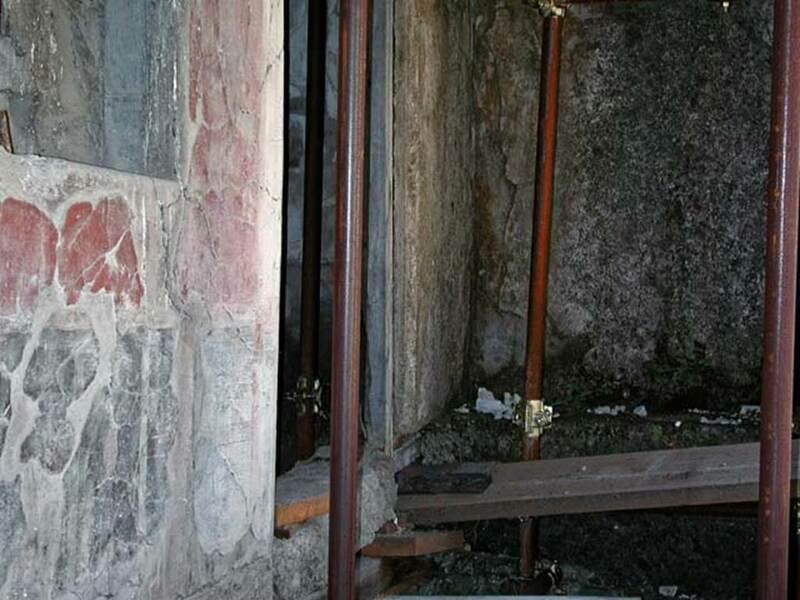 V.14/16, Herculaneum. September 2003. South-east corner of cubiculum E, or room 7, on upper floor. V.14/16, Herculaneum. September 2003. 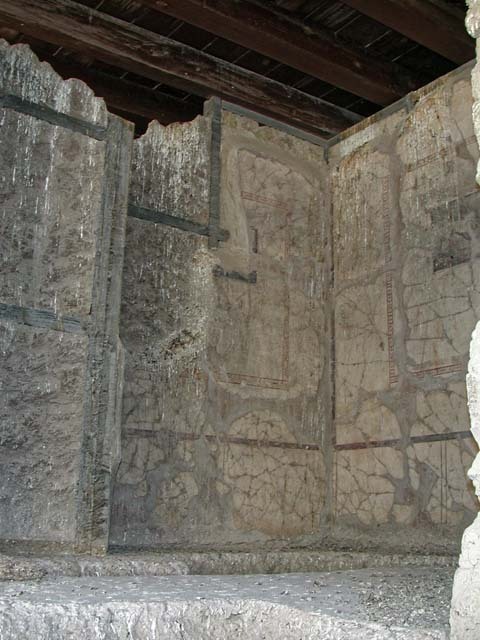 East wall of cubiculum E, or room 7, on upper floor. V.14/16, Herculaneum. September 2003. 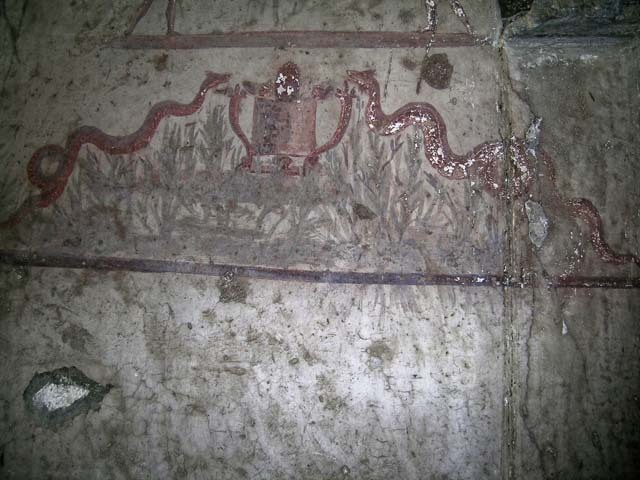 Detail from east wall of cubiculum E, or room 7, on upper floor. V.14/16, Herculaneum. September 2003. South wall of cubiculum E, or room 7, on upper floor. V.14/16, Herculaneum. September 2003. 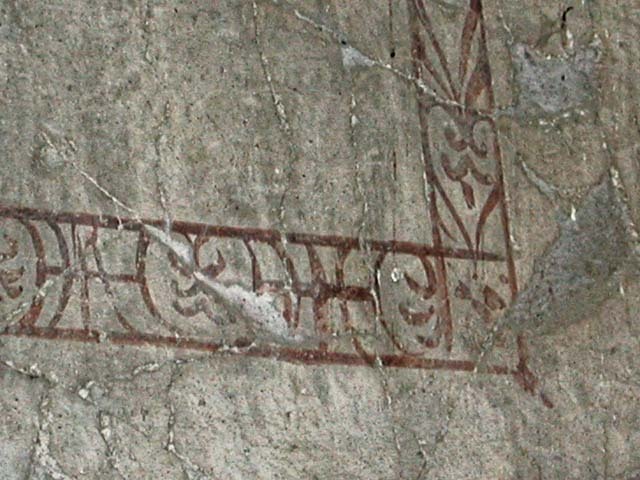 Detail from south wall of cubiculum E, or room 7, on upper floor. V.14 Herculaneum. May 2006. 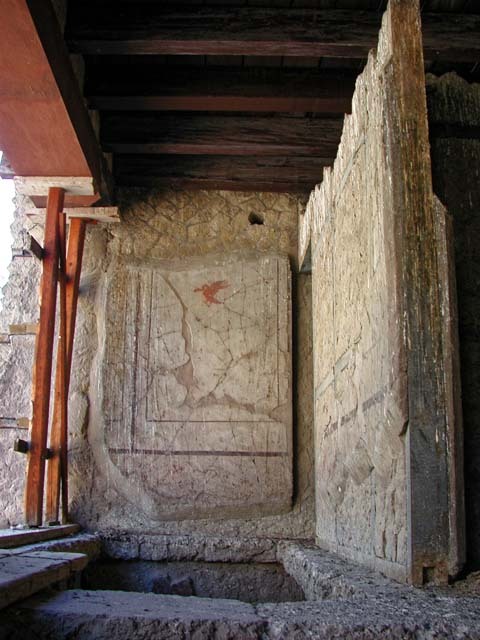 Upper floor apartment with lararium on rear wall of room L or room 9, between two cubicula, E and F.
V.14/16, Herculaneum. September 2003. Lararium on south wall of upper room L or room 9, above V.14. The doorway, on the right, would have led into a corridor “6” leading west into other rooms M, N and O (rooms 13, 14 and 15). 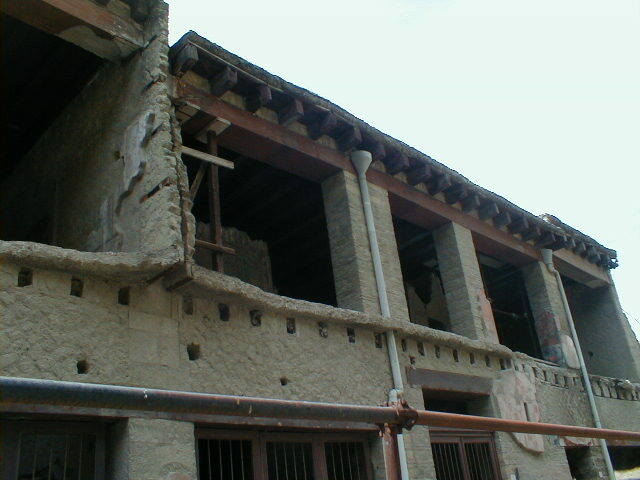 V.14/16, Herculaneum, May 2003. Room F, also known as room 8, on the upper floor, south wall of cubiculum. 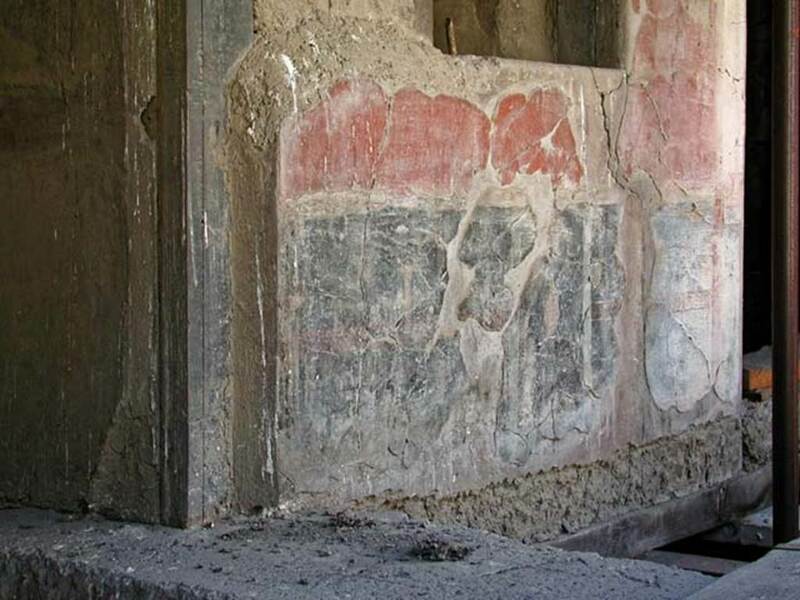 Maiuri described this room as – “the cubiculum F decorated with red panels sandwiched by white bands with paintings of architectural perspectives, and flanked by a corridor illuminated by a window of light corresponding to the stairwell that came upstairs from the workshop V.14”. V.14/16, Herculaneum. May 2004. Looking towards south-east corner of room F, aka room 8, on upper floor. Rooms on the west end of the upper floor. Upper floor room on west side, looking south towards site of room A, the so-called “room of the cross”. Rooms O, N and M (or 13, 14 and 15) on west side, behind room G (16) and above V.13. 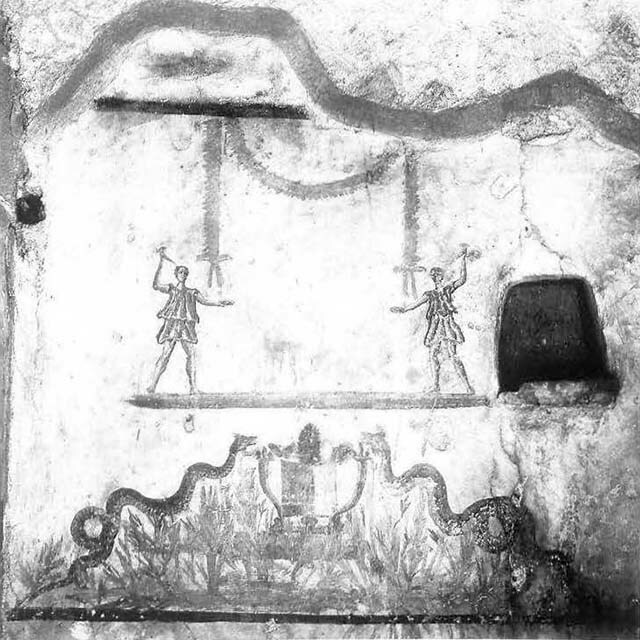 with the zoccolo/dado adorned with recurring spiral motif, and the walls separated into compartments by candelabri and garlands: but there are only mutilated traces of the medallions that decorated the squares of the second room”. 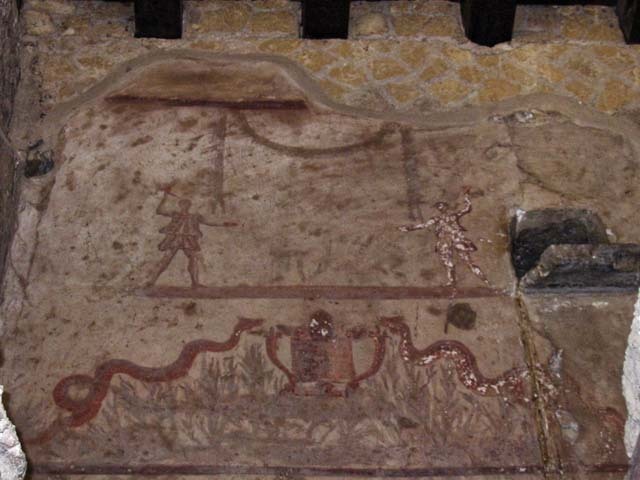 Upper floor, remaining decoration from rooms behind room G (also known as room 16), above V.13. 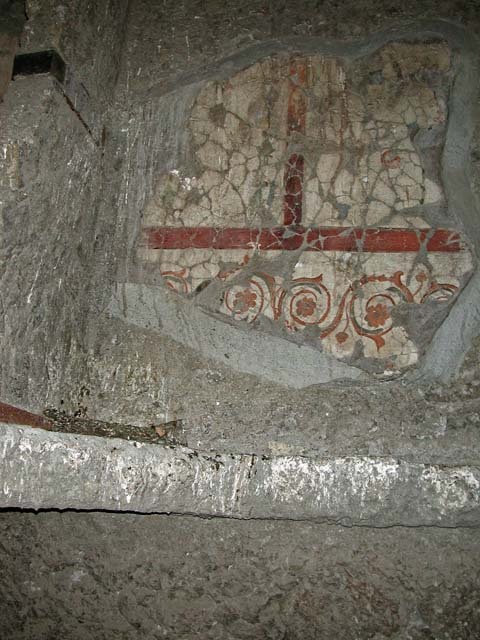 Upper floor, remaining decoration of spiral motif on zoccolo/dado from rooms behind room G (also known as room 16), above V.13. 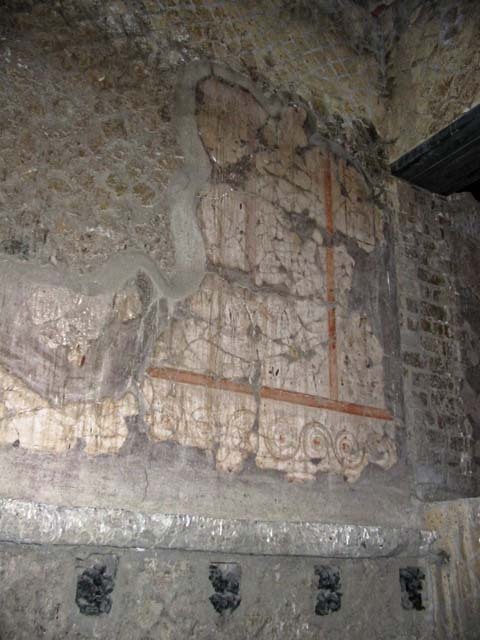 Upper floor, remaining decoration on wall of rooms behind room G (also known as room 16), above V.13. 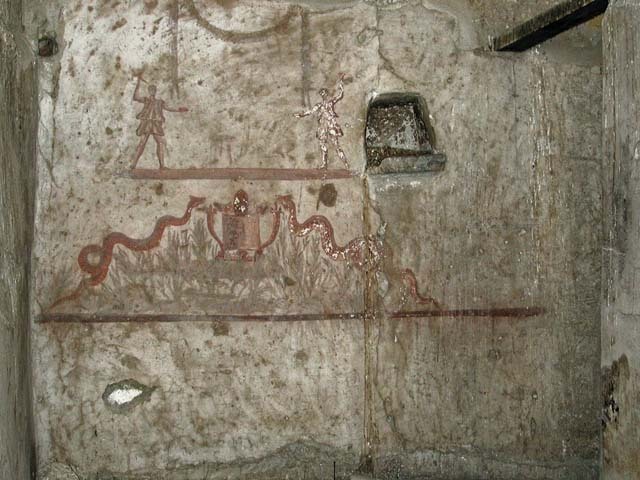 Upper floor, detail of decoration on wall of rooms behind room G (also known as room 16), above V.13.